I'm jumping in here to share a guest post I have up over at God-sized Dreams today! My life is a little crazy at the moment, and I'm praying soon I will have the space to sit and write again. But for now, it feels good to be here and there. Let me know how you are! 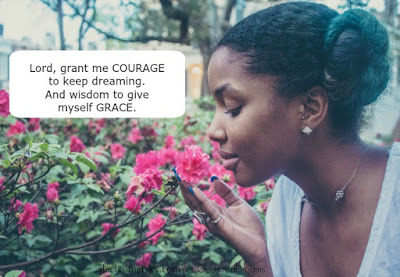 If I had to say what I needed more of, it would have to be courage and grace. More courage to take those leaps of faith with my eyes open instead of sealed shut like a scared little child. Courage to hope, dare, and dream in spite of maybe looking stupid, even if it's only me that thinks so,...especially when there is the possibility to fail. For a while dreaming with other like-minded dreamers began to feel like a curse, because it seemed like we all had similar dreams, to write. But as I read Holley's book I came to realize that "even if someone else's dream looks, sounds, or even feels like yours-it's not the same." God give everyone the same dream? Please join me at God-sized Dreams to read the rest. See you there! P.S. God-sized Dreams has a new linkup called #DreamTogether on Mondays. Everyone is welcome to linkup an encouraging post!